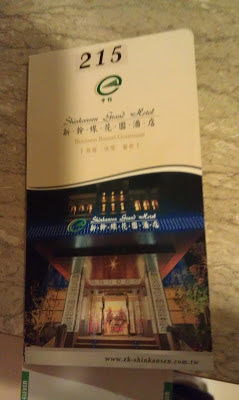 In my 2012 trip to Taiwan, I did stay a night in Taichung after visiting Feng Jia night market. The initial itinerary in plan was to stay in Beacon Hotel but our tour guide said that Apple tour is providing us another better hotel last min by "upgrading" us to this new boutique hotel "Shinkansen Grand Hotel". The name of this hotel sounds v glamorous rite..sounded like the Japan Shinkansen bullet train, but too bad nah..there is no relation at all about bullet trains and this hotel. 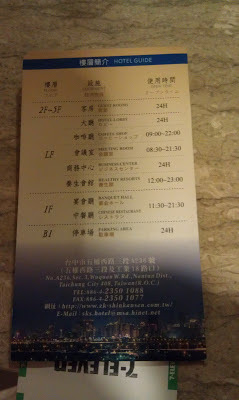 So dun expect to see any bullet trains room something like that when you stay here..lol. Actually, the first sight when I reached the hotel outside..I'm not kinda impressed with the hotel as the hotel looks more secluded with not much entertainment nearby surrounding, except for one convenience store, 7-11, right opposite the hotel. No night entertainment..sien..luckily tapao some food back from Feng Jia market earlier to party in the room. You can check here for more info about each room types and the rates. I stayed in Superior Twin room, which has 2 single beds. One thing that I'm quite pissed off with is the hotel staff here. They never admit is their mistake for not activating my room card! They insisted that they did activated my card and made me sounded like an idiot who did not know how to open the room door *wtf* And make me stand outside my room door for like 15 mins..shesh! They really should improve their service in this as I don't mind you missed out to activate my room card but at least you should learn how to admit your mistake and apologized! Apart from that, overall..the hotel room is very comfy and nice. And there is quite a vast variety selections in their buffet breakfast too.